A fun everyday shoe to add in your everyday wear. These Michael Antonio Louie Black pumps are comfortable, fun and super stylish. Covered in soft synthetic Nubuck upper, with a patent round toe. Heel height is 11.4cm, and a hidden platform is 1.3cm. 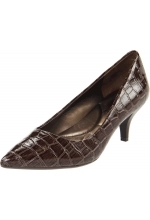 Work these babies with any corporate wear, or rock them in an outing with a pair of skinnies and a sweatshirt.